This entry was posted on August 14, 2017 by Jessica Anderson. It’s Fantasy Football Season, finally! Time to research your team and respond to your inbox or Facebook requests from your commissioner. 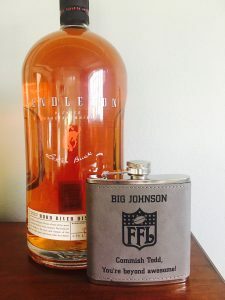 One way to thank your commissioner for their time and efforts is with an engraved flask and favorite spirit. Your commissioner has a hard job, it takes time to herd cats. They have to deal with whiners at times. And they coordinate everyone’s schedules when setting up the draft, which can be a real PITA. Here are some ways you can show your league commish how much you appreciate the time and effort they put into your league. 1. Respond to their requests and information in a timely manner. Nothing is worse than not hearing from everyone when trying to nail down a date or collect fees. 2. Don’t complain. You’re not doing the work so quit whining. 3. Be excited and participate. It makes them happy knowing everyone is having a good time. They also appreciate keeping a group of guys or gals together that would otherwise drift apart. 4. Say thank you. Enough said. In addition to your participation and good attitude, a little thoughtfulness from your league goes a long way. A small (or large) gift of appreciation will make your buddy feel good! 1. Bottle of favorite liquor – Top Shelf is always appreciated! Recognize the guy who does the most work for your league, after all he devotes time and dedication for you to have fun. Having a good attitude, answering texts, messages or emails, and saying “thanks” goes a long way to thank someone for a hard task. Have a great fantasy football season!